Today, I'm sharing another post by my church musician friend, Janis Maxwell. Janis is Director of Youth Music Ministry and Organist at Athens First United Methodist in Athens, GA (Go Dawgs!). 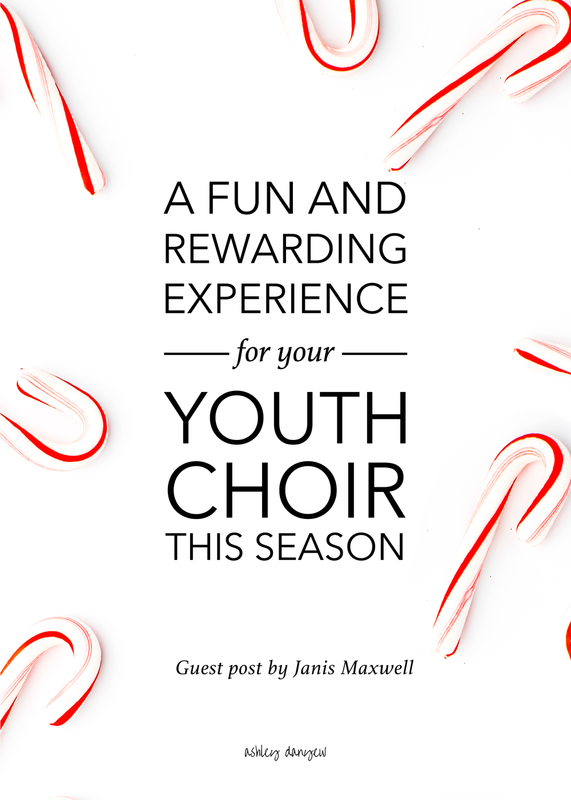 When it comes to youth choir and youth ministry, she is a wealth of knowledge and creative ideas and I know you'll love what she has to share. A few years ago, I scheduled our youth choir to sing at a local assisted living facility, very early in the school year. I realized pretty quickly that we would have no music prepared that early in the season. I am still not sure how someone with as much gray hair as I have could have made such a rookie mistake, but there it was. The visit was looming and we had maybe one song learned. To cover my error, I had to get creative and do a lot of praying. The result was proof that God answers prayer! I dug around our church closets and found a box of old paperback songbooks full of the “oldies but goodies” hymns that our seniors love. Then we spent one choir practice going through this book and singing through the most familiar tunes. I was surprised how quickly the kids caught on to things like “I’ll Fly Away” and “Leaning on the Everlasting Arms”. When we arrived, we sang our one song that we knew. Then we passed out the books and had an old-fashioned, intergenerational, sing-along! The residents loved it and really sang out with us! We mixed a few praise choruses in and the kids were amazed these “older” folks knew a lot of the newer music as well. After about 15 minutes of singing, we did an activity. I love the interactive stuff and think it is so important to get the kids into the “audience” to talk with these awesome seniors. I had each student “interview” an older adult. What job did you have when you were 16 years old? Where is the furthest place you have visited? We helped the kids all find a partner and gave them about 10 minutes to do this. The kids came back up to the front of the room and I thought we were about to say our goodbyes. On a whim, I said, “Who would like to share one of their answers?” Every hand in the choir went up. I realized something off-script was about to happen. I called on one student to tell us what adventurous thing her interviewee had done and she said, “Mountain climbing in Africa”. Then, I turned to the seniors and let them guess who had done this. Turns out, they didn’t know a lot of things about each other! They had a blast trying to figure out who had traveled the furthest, what kinds of jobs their peers had done, and many more things! This activity helped our students realize something fundamental: that seniors are people with real pasts and amazing stories. It also gave the residents an opportunity to find out things about their neighbors that they hadn’t known before. If you are looking for an outreach activity to do during the holidays, I hope this is helpful! My prayers are with you as you do what music ministers do best: spread love and peace and comfort through the music we make together. Photo Credit: SC Stockshop. Used with permission.